A fine 18th century thatched Grade II listed stone built barn in the centre of a quiet Dorset village in the heart of Hardy country. 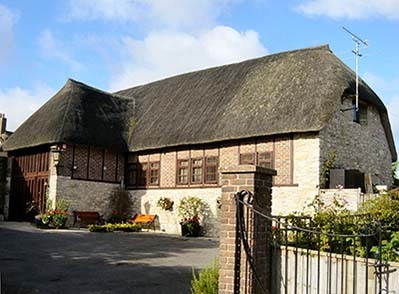 The barn was fully re-thatched in 2004. Following extensive restoration and improvement, this historic barn provides a stunning main reception room with galleried master suite above, including a library, snug, master bedroom and bathroom. 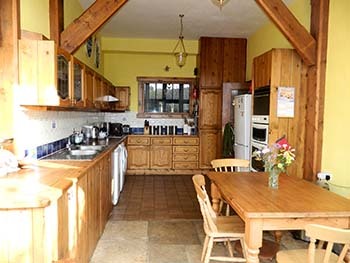 The barn has a large, bright kitchen / breakfast room and a further four bedrooms, including an en-suite bathroom, an en-suite shower room, a family shower room and further separate WC. 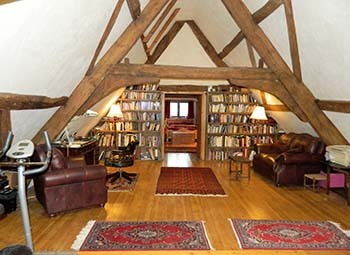 Original half-cruck oak beams dominate the ceiling of the spacious main hall. The reception rooms are large enough for entertainment on a grand scale. These have included concerts, operas, barn dances and workshops. RECEPTION HALL (16'5 x 6'11) tiled floor. Guest WC. MAIN HALL (38'5 x 20'5) Breathtaking room with 17'9 ceiling. Exposed roof truss timbers, natural stonework. Windows (E,S,W). Glazed garden door. Tiled sitting area, wood-burner effect gas fire. Carpeted dining area, stairs to gallery and master suite. 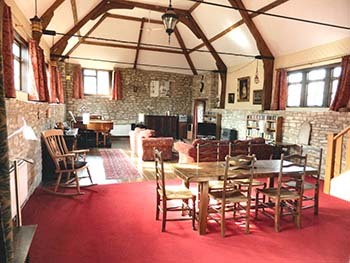 KITCHEN / BREAKFAST ROOM (19' x 11') High ceiling, full height windows, glazed barn doors to rear garden. Part original flagstone floor. Oil-fired combi-boiler. Wrought iron gates to tarmac forecourt with parking for up to six cars. An enchanting, well-stocked walled courtyard garden, with paved seating areas and soft fruits, is concealed to the east of the Barn. The west-facing back garden comprises: a brick-paved terrace with barbecue, a gravelled seating area, divided by a pergola from a small lawn with perennial borders and small pond. At the north end of the Barn is a small garden shed and oil tank. Of historical interest, Barton Barn was at one time the barn belonging to Stafford house, a fine Tudor manor. 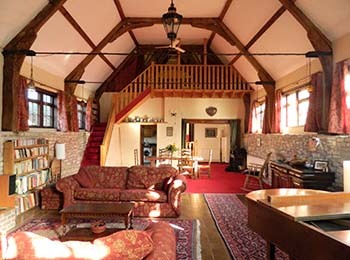 The Barn sits between secluded cottage gardens in the centre of West Stafford, two miles east of Dorchester. Tucked away in the centre of the village, between the fine 15th century church and the celebrated Wise Man pub, the Barn's 3' thick walls and deep thatch provide superb insulation. This pretty village is set in a countryside of water meadows and trout streams. Beautiful country and riverside walks can be enjoyed from the doorstep. Dorchester offers extensive facilities, including inter-city train service to London (2 hrs 20). Weymouth (9 miles) offers sailing, other water sports, and cross-channel ferries. Came Down (4 miles) has an 18 hole golf course. Nearby trout fishing in the River Frome. © barns etc 2013. All rights reserved.